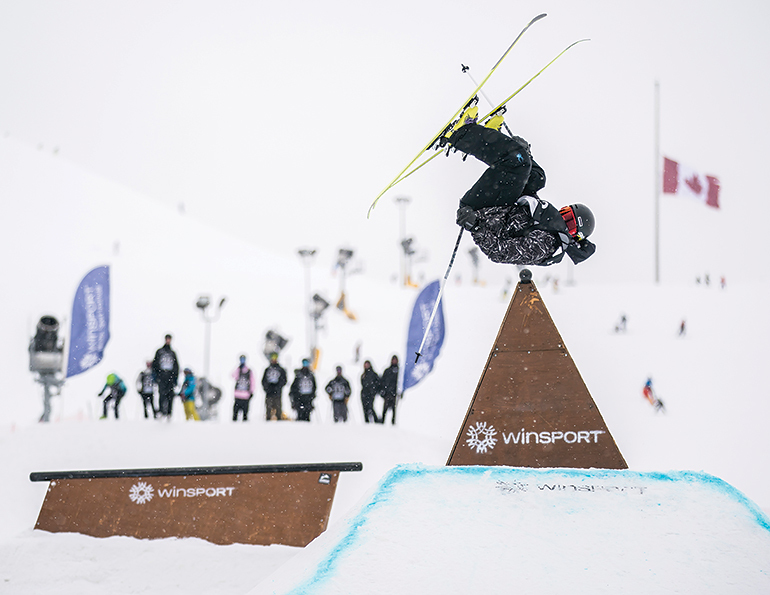 WinSport, the Winter Sports Institute at Canada Olympic Park in Calgary, held the inaugural Sun’s Out Guns Out rail jam last April as a creative way to end the season—the hill closed for the season an hour after the event concluded. The two-day event brought out intermediate and advanced skiers and snowboarders from Calgary and beyond. It took one cat operator and four members of the park crew two days to build the setup, located in the middle of the hill in front of the day lodge for primo spectating. The setup included a closeout to down bar, a flat bar wall ride, and a little wally feature. Day one was for skiers, and about 50 athletes competed. 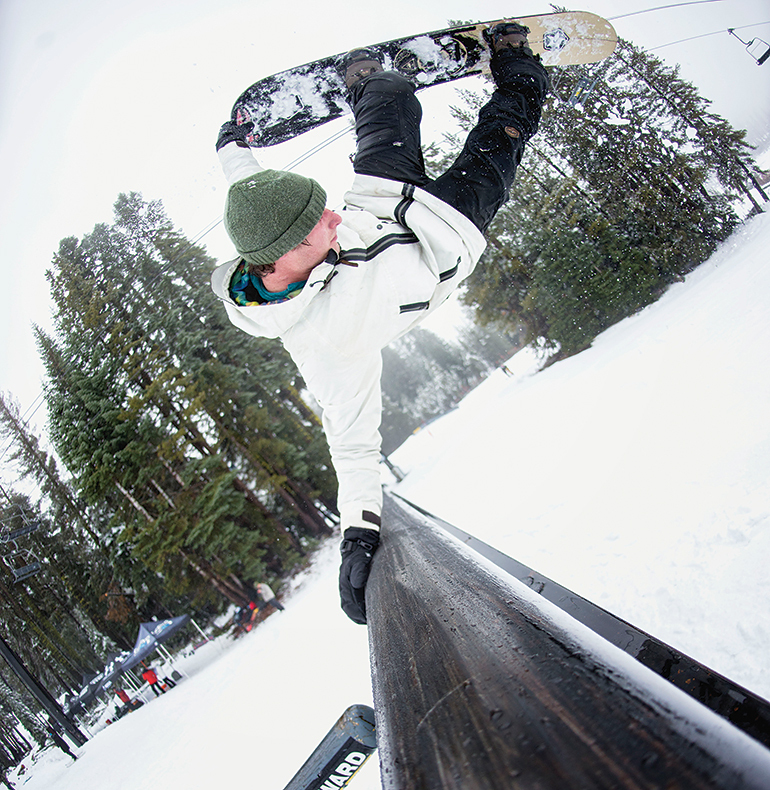 About 40 snowboarders competed on day two. Due to its success, Sun’s Out Guns Out will now be the park's annual season-ending event. Canada’s Prime Minister Justin Trudeau is a snowboarder, and a few years ago a photo of him doing a method made the rounds on social media. Mt. Sima’s park builder, Tyler Nichol of Transition Industries, and the crew at Mt. Sima in Canada’s Yukon Territory were joking that it’s all about the “Trudeau methods,” perhaps both political and freestyle. So, the Trudeau Method contest was born. 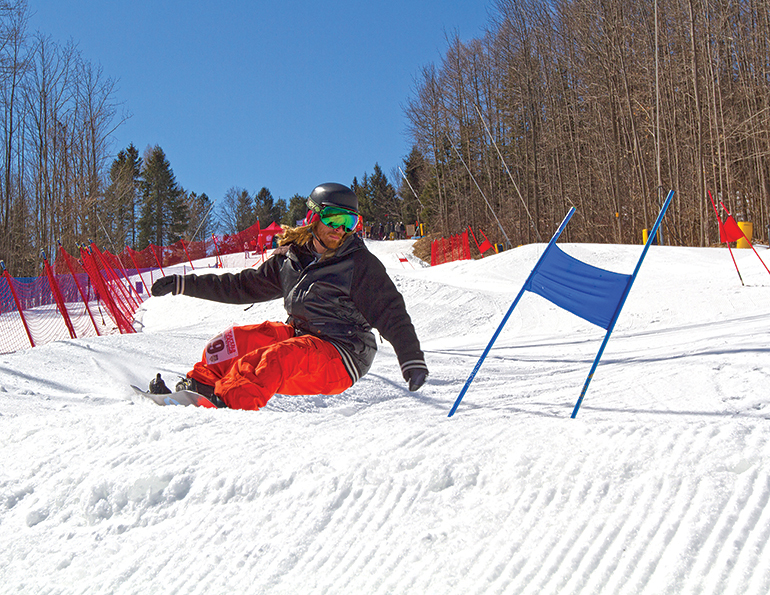 About 30 participants of all abilities came out for last season’s third annual contest, held during the resort’s spring weekend called Simapalooza. It’s held on a medium-size jump with Canadian flags flapping everywhere. Prizes, awarded for most stylish method, most Trudeau-like method, and best method in a rotation, are, appropriately, large Canadian flags. 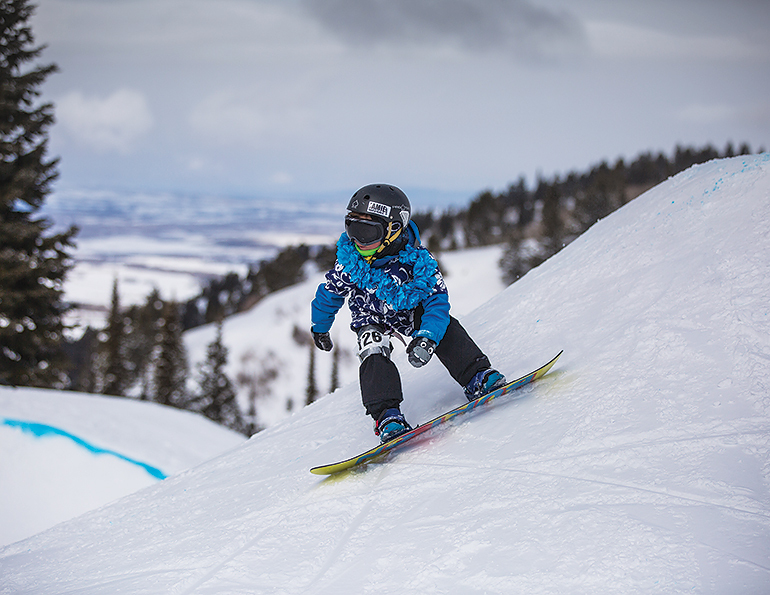 Pro snowboarder and Olympic Gold Medalist Torah Bright created this free event for kids age 17 and under. Torah and an all-star lineup of Australian Olympians and snowsports pros coach kids in a custom-built park for a couple hours in the morning, break for a BBQ lunch, and then return to the park for more coaching and a jam session, followed by an autograph signing and giveaways. Bright worked with the Thredbo terrain park crew to build a transition-based park with three different lines that step up in progression. Each line includes a combo of jumps, boxes, rails, hips, and spines. It took two cats to push the park into its rough form, and six diggers to complete the final handwork. Mt. Hotham, Australia, debuted its Night Rail Jam event in August. 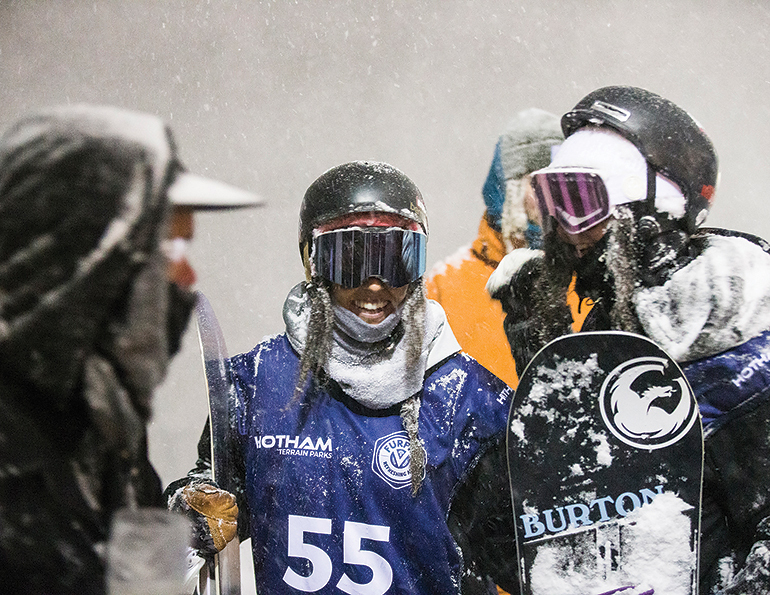 The event supported and promoted the #showusdagirls movement aimed at getting more women on snow, and in this case, in terrain parks. The jam-format event had a $5,000 purse, and awarded equal prize money for male and female winners. It drew 18 female and 53 male participants to compete in a custom-built park loaded with flat-down, flat and down rails, tubes, boxes, and hitching posts. A team of five park crew members designed the spectator-friendly setup, which was lit by spotlights and visible from the deck of a popular bar. It took eight hours of cat time to push the setup together, and six hours of raking and shoveling to complete. 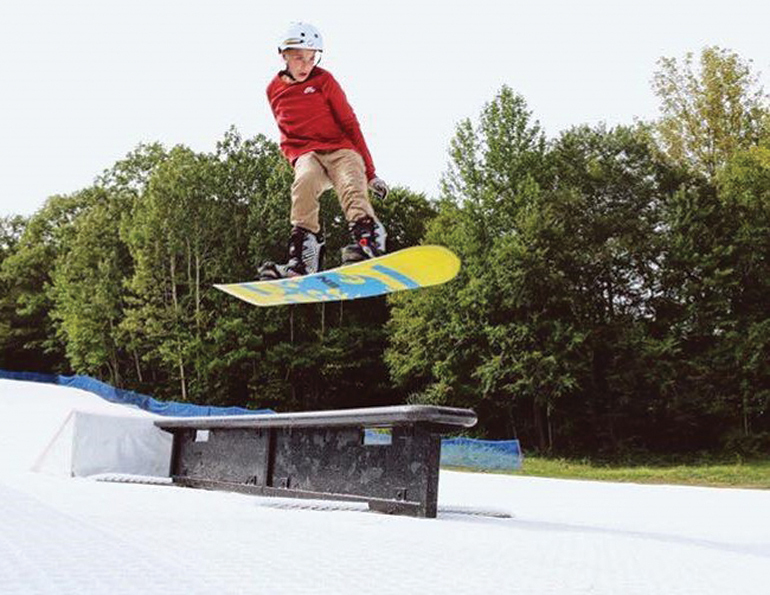 Powder Ridge, Conn., used its new Synthetic Snow Park to host a Halloween rail jam called Tricks for Treats. About 25 kids come out from as far as Pennsylvania and Vermont to participate in the jam session. 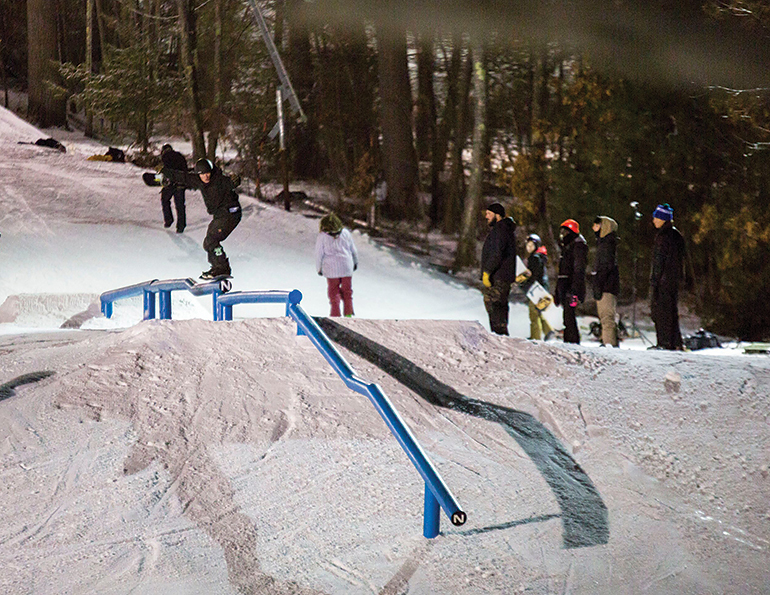 The park crew added extra features—rails and boxes— for the event. It took them about a week to prep, as some features required modifications before they could be safely set on the synthetic surface. Rails were shorter, and the crew added feet to the features, which were lag-bolted down and covered by a small section of synthetic. Winners received giant oversized candy bars, and lollipops. 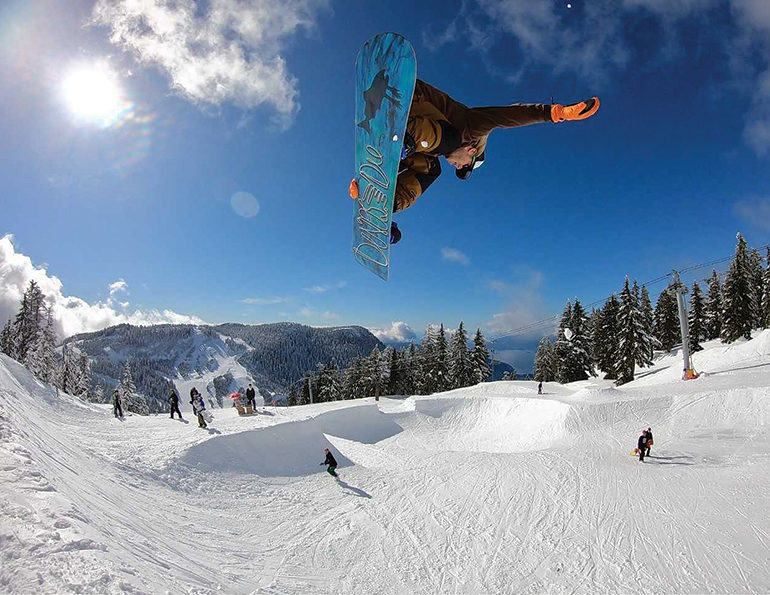 Cypress Mountain Resort near Vancouver, B.C., has more of a beginner skill-set in its parks, and structured events tend to scare away younger kids. 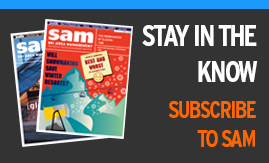 Thus, many of its events, including the Pool Party, are open to the public—no waivers, categories, or entry fees—and the crew hands out gear and goodies to deserving folks of all skill levels. The four-day build for the kidney bean bowl, right-sided hip/diving board feature started after a two-foot dump. The crew used a PistenBully Park Pro, 2-3 park staff, hand tools, string line, and a chainsaw to build it, mostly by digging down into the deep snow. It dumped another foot mid-build, so on the eve of the event, the crew cleaned out the pool, did the final shaping, and had a bluebird event day. 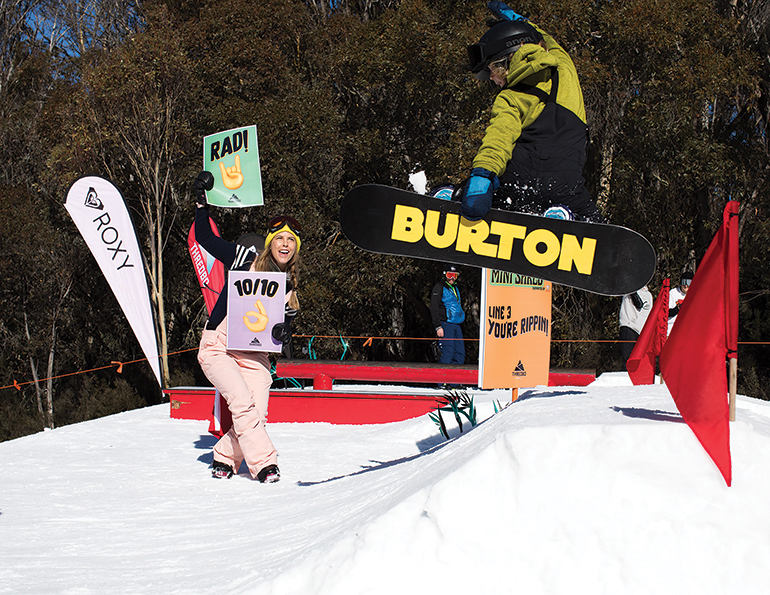 More than 100 snowboarders came out to race in the Mount Pakenham DBS (Dual Banked Slalom). It was a great turnout, considering that the Ontario ski area had decided to hold the race only three weeks beforehand, after a favorable turn in the weather. The dual banked slalom course took two days to build using a BR350 groomer and eight diggers to hand shape it. Park builder Andrew Burns says the decision to run a dual slalom event came down to getting “a wider group of snowboarders out to a contest. In our area it’s always the same group of younger kids at the rail jams and slopestyle contests. We thought this might get some of the older riders out.” And it did: the over-30 category was the event’s largest. 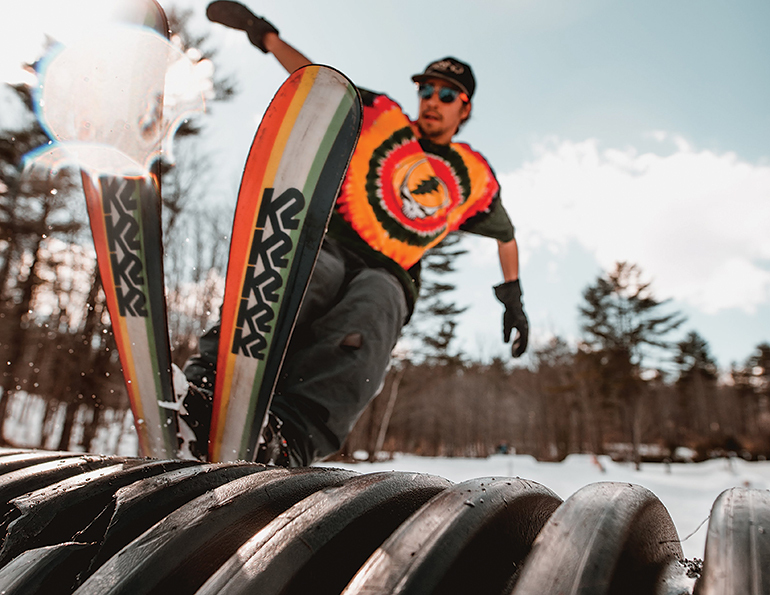 Titcomb Mountain in Farmington, Maine, got a boost to its park scene last year after park-skier Seth Noonkester was hired as GM. After the area closed in March, a local crew of volunteers, with the support of Noonkester, planned a post-season park event for March 31. Six days before the event and an hour into the build, Titcomb’s primary snowcat broke down. So the crew enlisted the mountain’s other cat, a BR160 Nordic trail groomer. 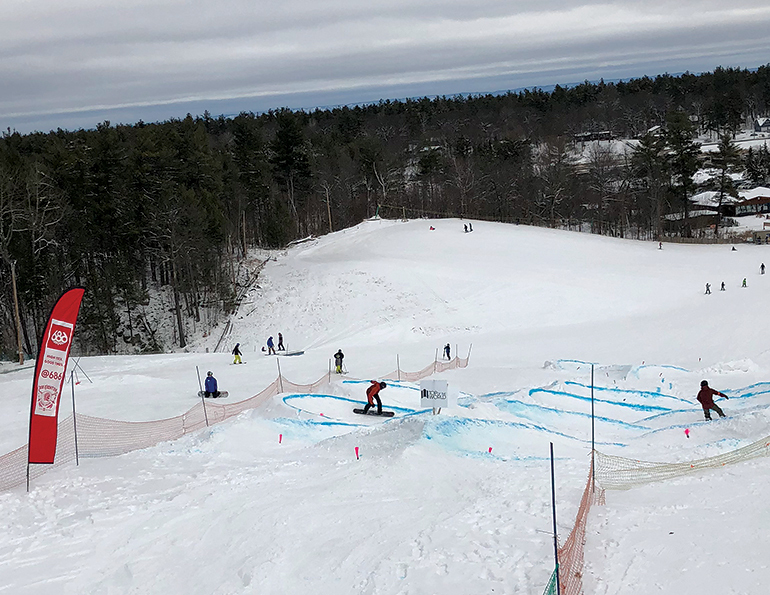 One cat operator, three regular volunteers, and a bunch of friends spent 24 build hours over four days to plant 10 rails and jibs on Titcomb’s beginner slope. More than 70 people of all abilities came out on event day to lap the park under bluebird skies. Photo: Jacob Dube. 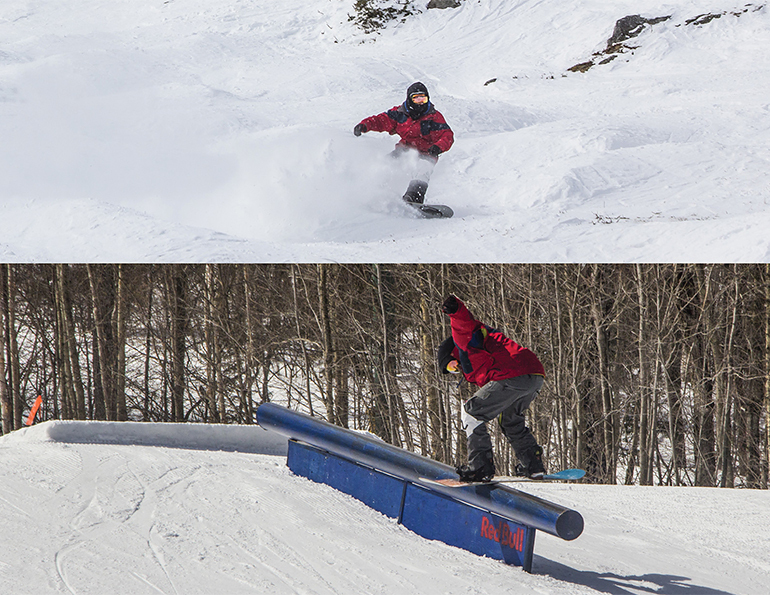 Jay Peak's inaugural Real to Steel contest challenged competitors' freeride and park skills in one event. The first of two runs was held on a steep, natural snow trail loaded with cliff drops. Jay’s patrol, parks, and events crews prepared the course using shovels, scoops, SPT park rakes, drills, and B-net. Competitors were judged on line choice, speed, style, and more. Next, competitors dropped into a slopestyle course with a three-jump line of roughly 25ft, 35ft, and 50ft, flowing into a plaza loaded with Red Bull-branded rail features. Scores were combined to determine winners. More than 50 skiers and snowboarders came out, the youngest a mere 8 years old. There is no better feeling than making it to the end of a really long/difficult feature, aka, “greasing" a rail. 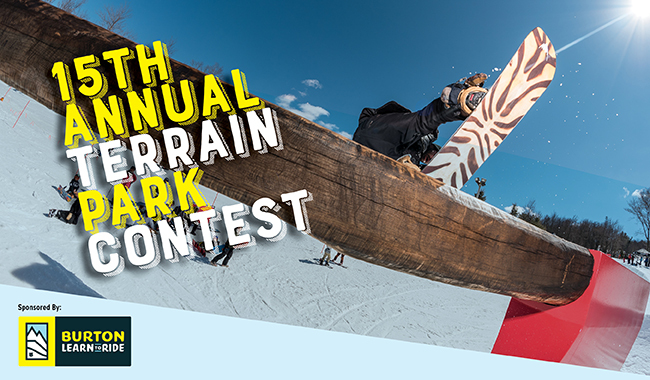 So Nashoba Valley, Mass., park crew crafted a contest that focused on doing just that. The single feature used in the contest was nothing short of a "Mega Rail:” a 98-foot-long combination of four rails—flat, drop, flat down flat, drop, flat, down flat down—made from 6-inch diameter snowmaking pipe. This monster had two takeoff options and a street-style lip at the final DFD. It took six hours for a four-man crew using posthole diggers and park rakes to set the rail into the ground and build takeoffs. The event was an open jam style format with competitors from age 13 up to late 20s. 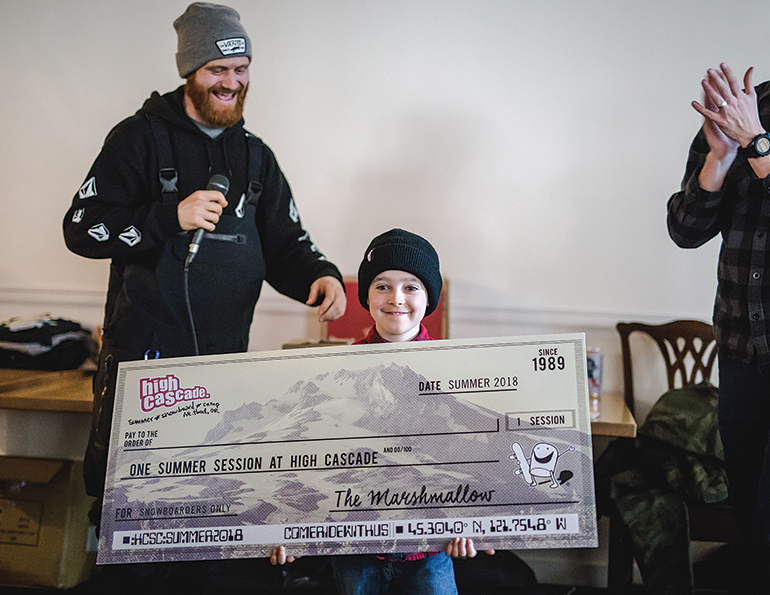 The first skier and snowboarder to "grease" split the entry fee kitty, while the best trick for skier and snowboarder earned prizes from sponsors. To help celebrate its 50th anniversary season, Mt. Hood Meadows revisited the Vegetate comps of the ’90s with the Toyota reVEGETATE. 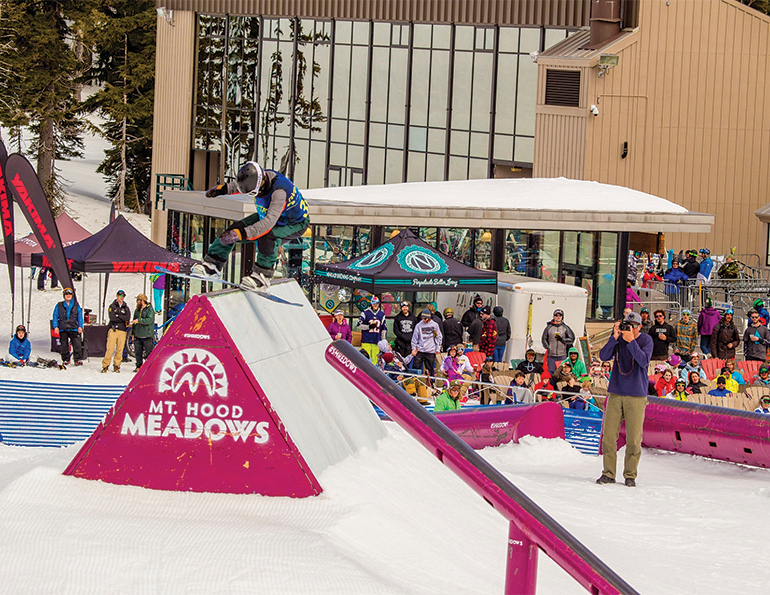 This two-day event featured a Speed and Style course and a Rail Jam competition. A combination of invitees and lottery winners vied for the $13,000 purse. The Speed and Style course was a hybrid banked slalom and slopestyle course that dropped nearly 1,100 vertical feet and channeled through six judged features. It took two operators 10 days to build using PistenBully Park Pros, an 18-foot pipe cutter, and a PistenBully 100. The rail jam venue took two operators and three diggers five days to plant 20 features. Twenty finalists competed in a 30-minute jam to determine the winners. Some proceeds from the lottery went to the Eagle Creek Wildfire Restoration Fund to aid rebuilding efforts after a 2017 forest fire. 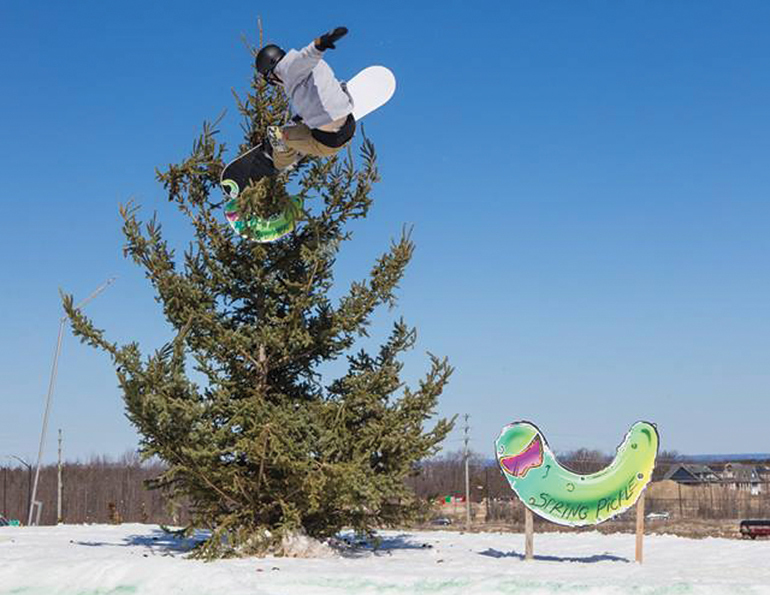 The Pickle Park Party Jam has been the season-ender for the last few years at Blue Mountain, Ontario. Formally called the Pickle Pipe Jam (when the resort still had a half pipe), the “pickle” part lives on thanks to the park builders’ creativity. The event venue consists of three decks shaped like pickles, each with a whole bunch of features, jibs and jumps for competitors to session. Two cats, with the help of a tractor, worked a total of 20 hours to stand up a few features, and two shapers worked for about 15 hours to finish the prep. The free jam-format event also has a viewing area with BBQ going to keep everyone fueled for an afternoon of fun. After a day and night of snowmaking in super cold temps produced huge “Dr. Suess-like” piles of snow on one side of its park, Alpine Valley, Mich., decided to use the mounds for a snow-surf comp at the same time as a scheduled rail jam last January. A high-speed rope tow runs right up the middle of the park—the rail jam went down on lookers’ right, snow-surf on lookers’ left. 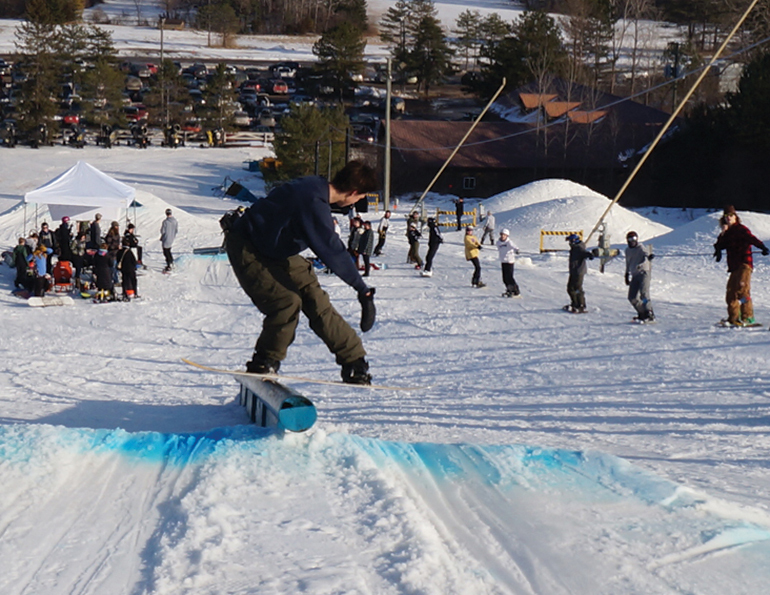 Around 60 snowboarders came out for the event, which was a loose, jam-style format on both sides. It was sponsored and run by a local shop, which brought a bunch of swag and gear—in addition to goods from Alpine Valley—that was awarded to riders who were killing it. The rail jam had two lines of features, including a 15' round up-flat rail, the dog house jib, elevated rainbow rail, a banked 12' flat-bar rail, a monster 45' round tube set up as a mellow urban down rail, and more, all culminating at the bottom rainbow-style c-rail called the C-Cave. Snow surfers slashed, gapped, and hand-planted down the series of mounds. 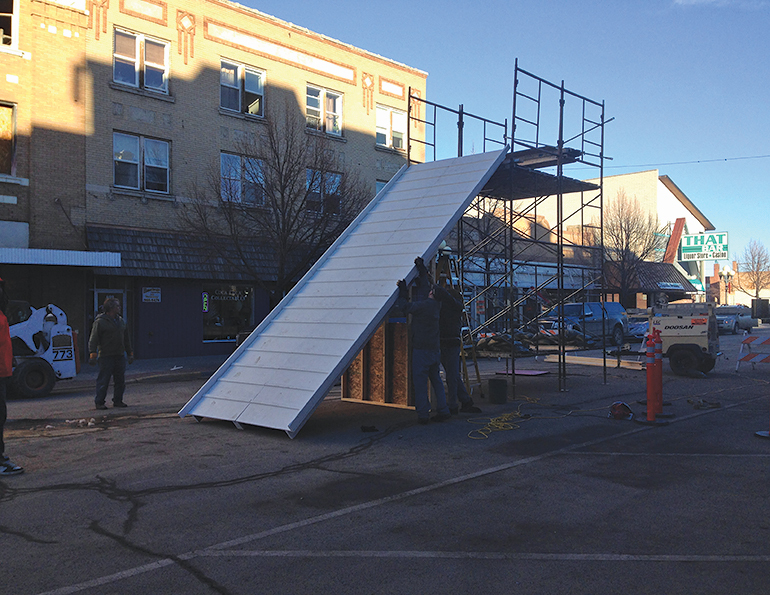 About a week before Showdown, Montana, opens for the season, the area stokes the local crowd by holding its annual Christmas Stroll Rail Jam on Central Ave. in downtown Great Falls. Although only 20 to 30 skiers and riders participate, the streets are packed with hundreds of spectators. Even more impressive is the build: the crew only has five hours between the time police block off the street and first drop. In that short window, crews construct a drop-in ramp out of scaffolding, haul snow, install and shape the features, barricade the event area, and complete other unique preparations. The Beaver Valley (Ont.) 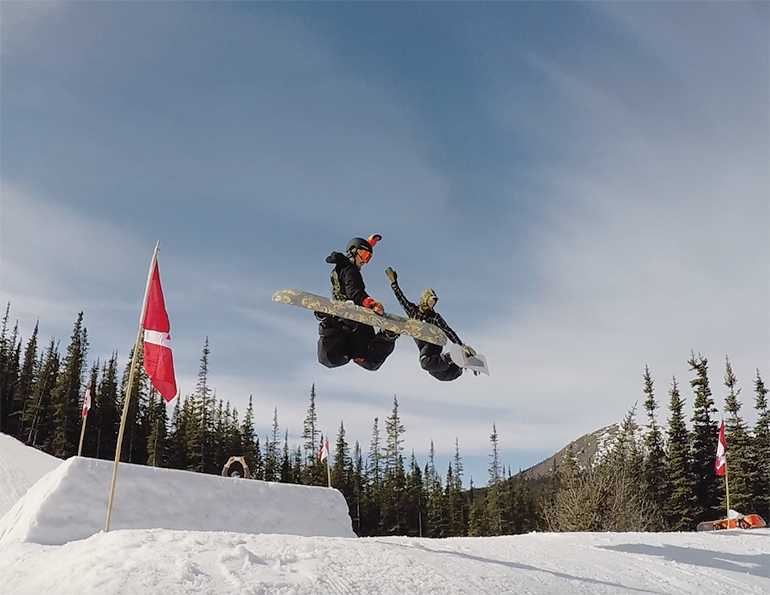 Banked Slalom—part of the WSF Banked Slalom World Tour— has grown from humble beginnings six years ago to a huge celebration of Eastern Canada’s snowboard culture. It also raises funds for a great cause. 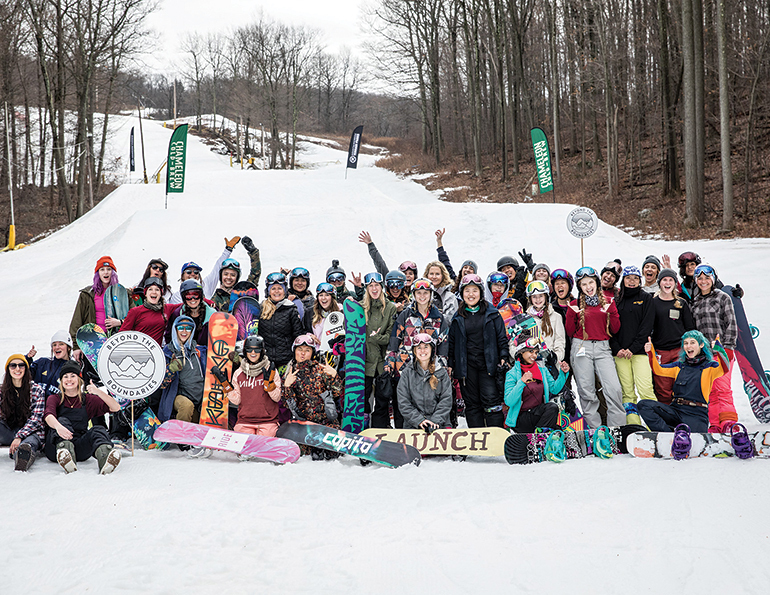 More than 300 riders came out for the 2018 edition, which debuted several new elements: an 80-foot hip in front of the party deck, a hike park in front of the base lodge, and a standalone mini-shred banked course for kids 10 and under. An industry rider category supported by Union Bindings enticed shop staff and reps to attend and participate. The event involved a week-long build by parks and events manager Caleb Bosse and his crew. Bosse drove a Prinoth Bison X and his crew of diggers took care of the details. They rebuilt the Main Park including more than 40 rail set-ups, jumps, transitions, and bowls, plus the hip, hike park, and mini-shred course. The event raised more than $13,000 in memory of Beaver Valley snowboarder Jacki Snarr to support the development of a local hospital.